At the resort town of Scarborough, England, sometime in the mid-1860s, a remarkably handsome and extremely charming Frenchman, Count Henri de Tourville, made the acquaintance of a well-to-do Englishwoman, Henrietta Brigham. A romance quickly developed, and the two were married. After a honeymoon touring Europe, the pair went to live with Henrietta's widowed mother at the family home of Foxley Hall, in Cheshire. They eventually had a son, William Henri. Unfortunately, the couple did not live entirely happily ever after. The Count proved to be one of those aristocrats who were big on keeping up a glamorous lifestyle without the glamorous income to back it up. He habitually "borrowed" large sums of money from his mother-in-law. She had even paid for the honeymoon. Before long, Mrs. Brigham became weary of dispensing cash, and came to the very reasonable conclusion that the Count was merely a golddigger. She not only announced that he would get no more money out of her, but that she was going to insist he repay the substantial sums he owed. This uncomfortable family situation found a tragic resolution one morning in July 1868. Tourville later told police that as he was cleaning a gun in the breakfast room of Foxley Hall, Mrs. Brigham asked to see the revolver. While she was examining it, the gun somehow accidentally went off, killing the poor woman instantly. She had been shot in the back of the head. Unsurprisingly, many people entertained some very ugly suspicions about this "accident," but the coroner's jury returned a verdict of "death by misadventure." Scotland Yard was brought in to examine the case, but DCI George Clarke, unable to find any solid evidence suggesting foul play, allowed the inquest verdict to stand. Henrietta de Tourville did not long survive her mother. Distraught at this family tragedy--and, very likely, tormented by fears over what might really have happened that fatal morning--her health gradually declined until she died in 1871. The Count now had Foxley Hall all to himself. To his chagrin, however, he was unable to exercise similar control over his late mother-in-law's fortune of £40,000. Shortly before her death, Mrs. Brigham made a new will that left her entire estate to her only grandchild, William Henri. Soon after Henrietta died, a mysterious fire broke out at Foxley Hall. De Tourville easily escaped the conflagration, but his son and his nursemaid were very nearly burned alive. The Count congratulated himself on having had the foresight to heavily insure the house against fire. It began to occur to the trustees of the Brigham estate that with a father so prone to "accidents" that happened to always benefit him financially, the odds of little William Henri making it to adulthood were small. They put the boy in the custody of a French couple who would bring him up in that country. His father was not allowed to know his whereabouts. This was the first of a number of setbacks for de Tourville. The insurance company, muttering some unkind suspicions about the Foxley Hall fire, refused to pay up. De Tourville also learned that the will of Henrietta's father William Brigham, who died in 1864, decreed that if Henrietta died childless, the estate would pass to the children of William's brother. As Henrietta's son was out of the country, these Brigham cousins insisted on taking possession of the inheritance. It finally began to occur to the Count that he had worn out his welcome in Cheshire, and he left the area for new pastures. He soon met a widow named Madeleine Miller. Miller was considerably older than the Count, but she possessed a fine house in London, a number of valuable possessions, and a private income of £7,000 a year. De Tourville found her irresistible. After they had known each other for only a few weeks, he persuaded Madeleine to marry him. His next step was to have her make out a will leaving him nearly everything she possessed. 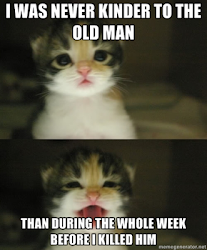 After that, he sweet-talked her into taking out a substantial life insurance policy in his favor. I trust you will not be particularly shocked by what happened next. In July 1876, the Count took his bride on a romantic tour of the Austrian Tyrol. On July 16th, while the newlyweds were staying in the village of Trefoj, near the Stelvio Pass, they hired a carriage so they could take a tour of the famed mountain scenery. The hotel staff strongly urged them, for their own safety, to take along a guide, but the Count cheerfully waved off their warnings. He and Madeleine set out with their driver. When they reached a secluded spot high on a narrow mountain pass, the Count told the driver that they no longer needed the carriage. He and his wife would walk the rest of the way. An hour later, de Tourville returned to their hotel...alone. Alas, he sighed, while standing on the edge of a cliff, his wife had taken a bad step and fallen to her death. A search party found her body the following morning. The police officer in charge of this latest tragedy was no fool. He did not like how the Count's face and hands were covered with deep scratches, suggesting de Tourville had been in a violent struggle. Despite the suspicious nature of this latest addition to the Count's remarkable number of personal losses, the inquest into Madeleine de Tourville's death ruled that she had merely been the victim of a terrible accident. After he had buried Madeleine, the Count wasted little time returning to claim the house and money he inherited from her--not to mention the life insurance money. Within only a few days of his arrival in London, he was participating in the social circuit, charming one and all and undoubtedly keeping a private list of all the wealthy and unattached women he encountered. De Tourville was oblivious to the fact that at long last, Nemesis was on his trail. Soon after he left Austria, a Herr Markreiter, an avid mountaineer who was very familiar with the area where Madeleine was killed, went to the police. He had read about the tragedy in the newspaper and was convinced it was impossible for her to have died in the way described by her husband. The slope from the roadside where she allegedly fell was a very gradual one. If she had fallen on it, she would merely have rolled for a short distance, sustaining no serious injuries. The staff at the hotel where the de Tourvilles had stayed stated that the couple had clearly been on bad terms. It was also noted that the Count had given different people completely differing versions of how Madeleine had died. When the Austrian police recalled how the not-so-grieving husband hit the financial jackpot by her death, they--a bit late in the day--realized they very likely let a murderer go free. They immediately applied for his extradition from England. When DCI Clarke learned of the request, he was more than happy to track de Tourville down and arrest him. The Count was attending a high society dinner party at the time, which must have made it a memorable meal for all present. 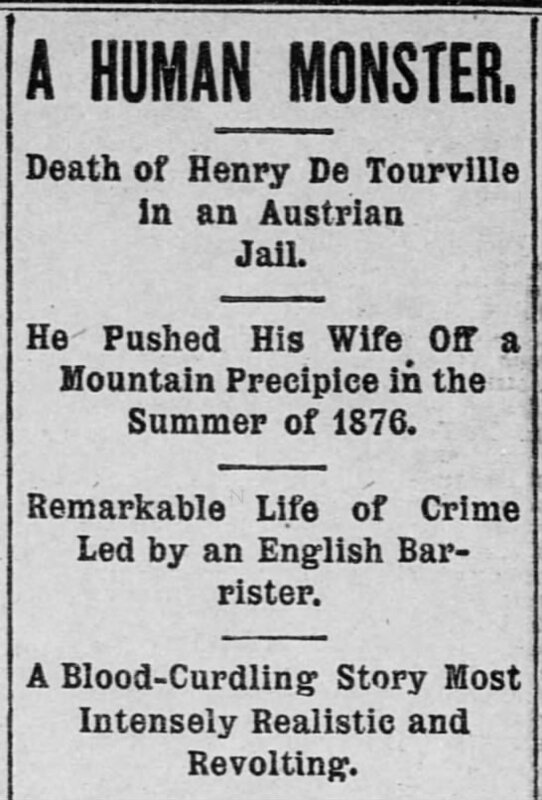 During his fight to avoid extradition, a curious detail was revealed: The suave "Count de Tourville" was, in reality, a former Parisian waiter named Henri Perreau. Despite the fact that Madeleine's money enabled her widower to hire the finest lawyers money could buy, a magistrate ordered his extradition. In January 1877, de Tourville/Perreau unwillingly sailed to Austria. After his exit from Foxley Hall, Perreau had improved his leisure time by training as a barrister. He evidently reasoned that the more he knew about the law, the easier it would be for him to break it. With his usual brash self-confidence, he insisted on representing himself at his trial. There is that old saying about lawyers who represent themselves having fools for clients, but given the evidence against him, it is doubtful that the greatest barrister in Europe could have saved Henri Perreau. By the time DCI Clarke showed up in the courtroom--carrying Mrs. Brigham's skull--in order to argue that her death had been not accident, but murder, it was all over for the self-made Count. Perreau was found guilty and sentenced to death. However, the sentence was commuted to eighteen years with hard labor. After an attempt to escape his first prison, he was transferred to the severe, high-security Karlau Prison in Graz, where he was put to work in the local salt mines. By the time Perreau died there in 1890, he was very possibly regretting that they had not quickly hanged him. His son, William Henri was about twenty at the time his father died. Contemporary news reports stated that he took his mother's surname and, when he reached his majority, inherited her property. After Perreau's conviction, it emerged that the law had probably underestimated his body count. It was said that shortly before his first wife Henrietta died, she had swallowed ground glass. Her husband had been alone with her at the time. Some years earlier, while working as a waiter in Paris, Perreau befriended a rich Englishman named Cotton, who was unwise enough to hire him as his manservant. During a visit they made to Istanbul, Cotton mysteriously disappeared. No trace of him was ever found. Immediately after Cotton vanished, Perreau unaccountably had enough cash to return to England and adopt his persona of "Count de Tourville," sophisticated aristocrat. One night, Lady Goring had a peculiar and vivid dream. She saw an old house that was unfamiliar to her. She sensed that she was visiting this house for an important purpose, but she did not know what it was. She fixated on one room,that was decorated in a striking and unusual style. Lady Goring saw an elderly woman dozing in an armchair by the fire. Then, she saw a man quietly enter the room. He crept up behind the woman, and shot her through the head. After the woman collapsed, he tried to arrange the pistol so it would look as if it had fallen from her hand. After arranging the gun and the woman's body to his satisfaction, the man left the room. Lady Goring saw this room and the face of the murderer so clearly that they became fixed in her memory. Some time after that, she and her husband sought to rent a house in the country. They visited various properties, including an old manor in Cheshire. The minute Lady Goring entered the house, she realized it was the house in her dream. The dining-room, she knew, was the place where she had seen a murder. When she asked the caretaker about the house, he said that the previous owners had been a man, his wife, and his mother-in-law. Sadly, the older lady had accidentally shot herself, after which the house was vacated. Unsurprisingly, the Gorings did not take the house, and Lady Goring does not appear to have sought any more details about her "dream house." However, months later, she was walking down Regent Street, when she was shocked to see a man's photograph in one of the shop windows. She recognized him as the man she had seen commit a murder. 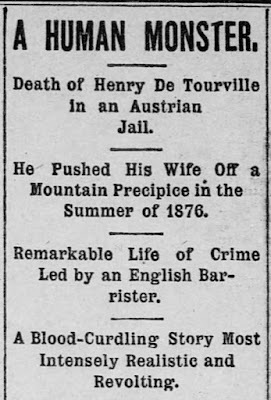 When she went into the shop to ask who he was, she learned that he was "Tourville, who was then being tried for the murder of his second wife in the Tyrol." One way or another, murder will out. Sometimes. Brigham. Plus a typo, which I fixed. Thanks for catching that. At last, those brutal prison regimes that have people working in salt mines paid off. Where are they now for some of today's 'Tourvilles'?